The Planning Department’s draft Transit Center District Plan for the rectangle bounded by Market, Steuart, Folsom, and mid-block between 3rd and New Montgomery is now online. 1. Build on the General Plan’s Urban Design Element and Downtown Plan, establishing controls, guidelines, and standards to advance existing policies of livability, as well as those that protect the unique qualities of place. 2. Capitalize on major transit investment with appropriate land use in the downtown core, with an eye toward long-term growth considerations. 3. 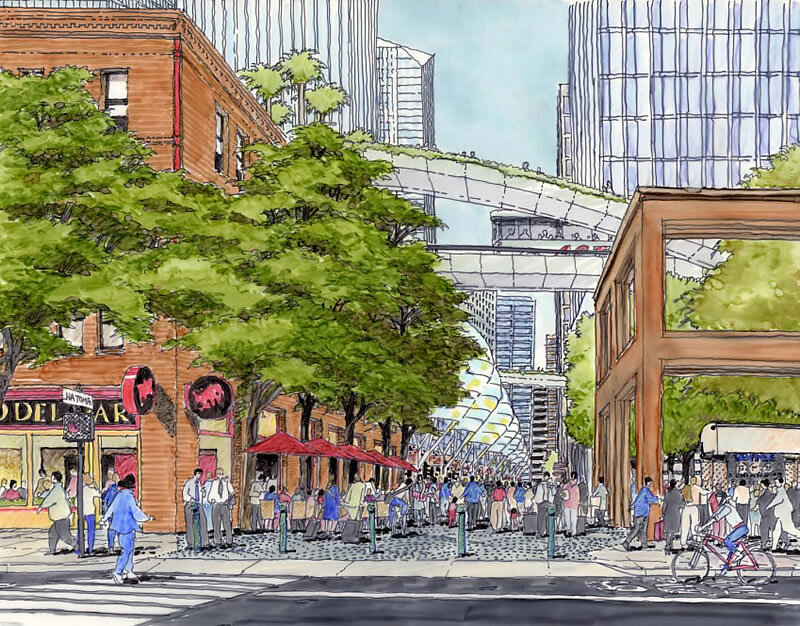 Create a framework for a network of public streets and open spaces that support the transit system, and provides a wide variety of public amenities and a world-class pedestrian experience. 4. Generate financial support for the Transbay Transit Center project, district infrastructure, and other public improvements. 5. Ensure that the Transit Center District is an example of comprehensive environmental sustainability in all regards. In addition to establishing a 1,000 foot height for the proposed Transbay Tower, the plan raises the height limit for six other sites to exceed the current 550-foot ceiling. And in addition to neighborhood open spaces either existing or already in the works, the Plan proposes a new half acre public plaza on the corner of Second and Howard/Natoma. 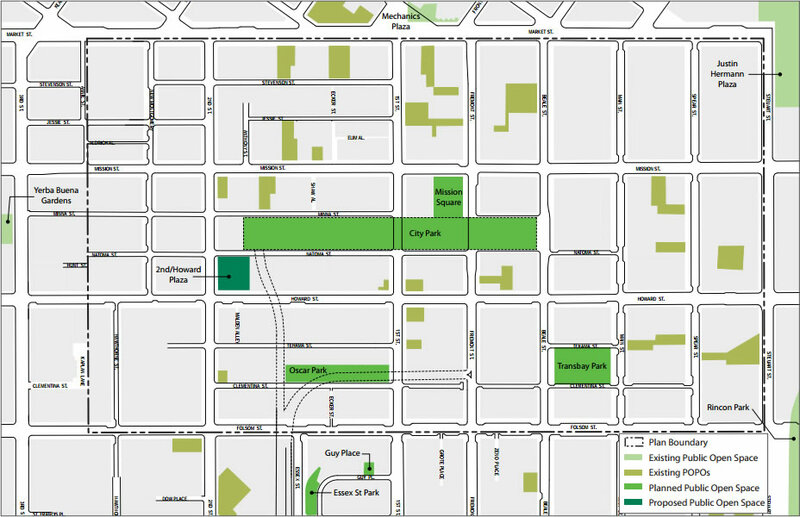 The plaza would serve as a gateway to the Transit Center and City Park as envisoned in the watercolor above. Total budget for the plan as proposed (excluding development costs for the new Transbay Terminal/Transit Center): $567,250,000. I’m biased because my organization has a small role in the project but I think it’s an outstanding urban plan. Whether it’s developed anything like the plan remains to be seen but if it does get done (the full build-out is 25 years!) it will be an amazing area in which to live and work. Just outside this district there are also preliminary proposals being considered to add towers on the land bordered by Howard/Hawthorne/Folsom/Third which would be built on top of a Moscone Center underground expansion to the east. When I grow up, I will have a 5,000 ft castle. Looks great. Too bad it will never happen. We’ll get some trees and some wider sidewalks, maybe. Building something 700ft tall on the block on the NW side of Howard between Beale and Freemont is going to upset a lot of buyers at the Millennium. It would upset me too, since I rather like Town Hall and would be sad to see it go! Reads like everything else the planning dpt has put out in the last several year… full of contradictions and wholly lacking in vision. The only thing it promises is to further hobble an already crippled department. A planning department unable to pass anything because of the web of restrictions they and our board of supervisors have created. Perhaps these are the dullest knifes in the drawer. The huge flaw is in regional transit planning. The downtown BART stations are already at peak hour capacity. Are we waiting for a “crisis” to address this? The MTC systematically withholds funding for upgrades to commuter rail (Caltrain) and keeps funding sprawl projects like BART to Livermore, airport connectors and BART to San Jose. Great to see this draft released. I know the fees will be the subject many debates, but I think a lot of thoughtful consideration and good community input is reflected in this draft. I’m especially heartened to see the great attention paid to the pedestrian environment (we’re all pedestrians, after all), green spaces (I’m hoping for a bike facility on that NE corner of Howard and 2nd, similar to the one in Millennium Park in Chicago), and … with little fanfare in the press, but something I’ve been encouraging … an expansion of availability hours of Privately Owned Public Open Spaces (like 101 and 55 2nd Street) from about 8am – 5pm (though the two mentioned stay open ’til 6pm) Monday through Friday to 6am – 9pm everyday! If these are truly “public benefits” in exchange for rights to build higher, they should be open at hours when people living in the RIncon Hill neighborhood can get home from work and have a community meeting at those spaces – actually offer the opportunity for nearby residents to use them instead of just providing a lunch space for office workers. What world are the planners living in? There is no market for 600, 700 or 1000 ft condo structures in SF. There may never be again but, if there is, it is decades away. Don’t hold your breath – the chances of this ever happening are about those of the proverbial snowball. Imagine if there was another TransBay tube or rail on Geary? The discussion in today’s paper on the Planning Department’s completed proposal for increasing building heights around the new TransBay Terminal omits reference to the primary purpose for the proposal. In 2006, Mayor Newsom ordered the Planning Department and other City agencies to study whether additional local funds could be generated to pay to extend Caltrain and High Speed Rail in a tunnel to the new terminal. The proposal released Thursday is the product of some two years of work and is now open for public discussion. All of the planning ideas and proposed new amenities are collateral to the overriding purpose of improving rail transportation. To date, that connection has mitigated possible controversies over increased heights. What about BART and the MTC? Why can’t SF lead? I’d prefer more condos, personally. I think the plan is primarily for office space, not residential condos. Office space and jobs will bring condos. I want to increase the condo supply, without increasing the demand. zig – how does BART to SJ induce sprawl ? That whole corridor is already built upon and BART would only encourage increased density along the corridor. Indeed both Alameda and Santa Clara counties are planning for transit oriented development surrounding the proposed station sites. And BART to SJ will not increase the level of traffic on the SF Market BART corridor. Why would anyone take a 2 hour journey around the bay probably requiring a transfer at the OAK Wye when they could do the same nonstop in less than an hour via Caltrain ? If Gil had read the report, he would have seen that most of the space in the planned towers is commercial, not residential. The plan assumes that most SF housing over the next 25 years will be built elsewhere. The plan states that it is important to plan for increased density so that there is land available for buildings to be added when there is demand for them, with the expectation that this would be a long-term vision. The biggest impact that no one is talking about is the actual closure of 1st Street to outbound Bay Bridge traffic. Right now, Bay Bridge line up starts at the 1st Street and backs up to Market, Bush and Battery. It was bad, but at least it was centralized in that area. You’d be somewhat safe traveling on other streets and getting around. By taking 1st Street out, you’re going to be diverting that Bridge traffic to every other block: Beale, Howard, Montgomery… you’ve take one bad traffic spot on a weekday afternoon, and expanded that throughout downtown. People will still be driving. 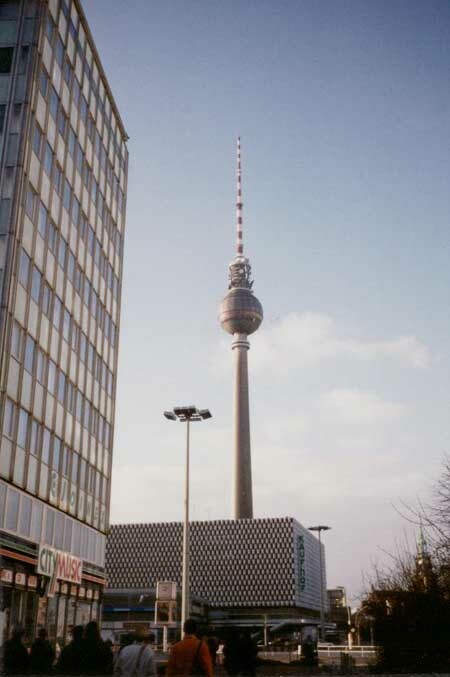 A glamorous tower will not make an impact on car reduction on the roads. Right now, Bay Bridge line up starts at 1st Street and backs up to Market, Bush and Battery. It is bad now, but at least it is centralized in that area. You’d be somewhat safe traveling on other streets and getting around after work without hitting absolute gridlock. By taking 1st Street out, you’re going to be diverting that Bridge traffic to every other block: Beale, Howard, Montgomery… you’ve take one bad traffic spot on a weekday afternoon, and expanded that throughout downtown. It is simply the wrong technology being used for the wrong purpose. Maybe not but Livermore might as might the extension out into far Eastern Contra Costa. This is because of station after station being built in places where people drive, park and head to work in SF. This is an issue now. All of this office space will induce quite a few more trips peak hour. BART needs to evolve into a system that can serve better downtown SF and the inner East Bay. Has any other city ringed its transit hub with enormous structures? These buildings cannot be torn down without enormous $$$$ loss, and you certainly can’t build under them if you ever need to extend or modify any subterranean structures. We’re locking our transit future into a box. Isn’t at least part of the reason for BART to San Jose that folks from the East Bay (whether on the Pittsburg line or the Dublin line) might have an easier commute to certain Silicon Valley locations? The San Jose/Santa Clara extension seems like a better idea than the Livermore or eBART/wBART plans, at least until we have another Transbay tube for HSR/BART. Agree that BART could use better metro service within denser areas (e.g. 30th/Mission and also some in Oakland, e.g. San Antonio, which might catch some folks in Alameda too). The problem with using old rail corridors, as BART did, is that they aren’t usually ideally placed for residential riders. The freeway medians aren’t often ideally placed either. Geary seems like a no-brainer to me (perhaps veering south under the park down either Sunset or 19th to Daly City), but the Geary merchants are so NIMBYish. How old will you be in 25-50 years? Will you still be in San Francisco? This plan is for the future, but not for any of us, for our sons and daughters, for our legacy. Let’s see – there is even less demand for more office space in SF than for more luxury condos. Either way, I don’t see this ever getting built out. Gil – the economy will eventually improve. When it does we will benefit from having shelf-ready development plans. So when developers are ready to pull the trigger on the project, the years of public review, EIRs, and entitlement acquisition have already been completed and projects can proceed directly to the design phase. Sure, I’m familiar with the “Caltrain Metro East” plans, but the Dumbarton rail bridge idea was about as expensive in the original estimate as BART to SJ was (about $2B in the original estimate for both, but BART to SJ was more recently estimated for $6B). ACE doesn’t cover places on the Pittsburg line (more Dublin line) and is an incredibly limited service (isn’t it 3 trains in the morning, 3 in the afternoon, with no commute-time flexibility?). In any case, as I mentioned, I have less of an issue with BART to SJ than wBART, eBART, and tBART, considering the Transbay Tube isn’t getting any bigger. Milkshake – nothing lasts forever so sure the economy will eventually improve. But that does not equate to SF needing millions more sq ft of office space when the economy does improve. The city has probably all the office space it will need for the next 20 years right now. I remain totally unconvinced this will ever see the light of day. I also firmly believe that when SOMA eventually develops out it will be on a much smaller scale. We are all aware of your views and your anecdotal stories. Do you have anything else to support your position, which you have to admit is an EXTREME, EXTREME outlier of a position? Only in San Francisco would we think of this as a project whose implementation time frame is for “our children or grandchildren”. IF there was a financial funding plan and IF Robert Moses were the Project Manager and IF we could transport the so-called progressives on the Board of Supervisors to Alpha Centauri then I give this a 50% shot. I was at Town Hall in August, as I had not been in some time, and “discovered” it had a superior beer menu. I believe I’m with Mr. Moses (of New York). Perhaps ten years ago a friend who was given/found some old BART blueprints (dated 1950’s) told me they described a system four or so times larger than today’s (I hazily recall he said the plan was for ~100 stations and multiple hundreds of miles). Since the Bay Area may need public transit for centuries, I’d say we have a ways to go yet. More stations on existing lines would be great. That extension to San Jose? Given what I know about the 880 corridor? Even better. Your friend is probably referring to the Army-Navy plans that were originally drawn up for BART or some derivative of those plans (I believe their process started in the late 40s). IIRC, this plan had 300+ miles of track planned and several more stations. It was pretty ambitious. I believe the SF Public Library has copies of these plans in its archives. The last major proposal before what actually ended up being built had lines out to San Rafael and the short-lived Santa Venetia in Marin (using the Geary line and the Golden Gate Bridge) and a continuation from Daly City to Palo Alto. The plan likely would have extended the Marin line to Novato eventually. If I remember correctly, this revised five-county plan may have been around 120 miles or so. San Jose wasn’t on the radar because it was still a sleepy little town in those days, and Santa Clara County didn’t want to join the BART district because they were working on their “expressway” system. Btw, agree that it would have done SF some good to have had a Robert Moses-type. Caro’s The Power Broker is a good read. It would do the Bay Area some good to have a more integrated metropolitan transportation process (roads and transit) instead of several fiefdoms doing their own thing. I also find it hard to believe that Muni is the best the City of SF can do, but then again, I’m also constantly surprised by the ridiculous NIMBYism here, especially with respect to supposed “historic” properties — maybe none of these things should be surprising to me. SF did. They wanted to put a freeway right through the Panhandle and the park. A page out of Moses’ book. Thank goodness that didn’t happen. I agree. But what is more needed is a consolidation of the multiple Bay Area transit agencies into one – or maybe two/three. These fiefdoms with their perk administrative jobs will never let that happen. And, unfortunately, we don’t have a Bay Area wide initiative process where voters could make it happen. In Portland the transit system is truly metropolitan – one agency/3 counties. The same is true in many major cities. Beautiful skyline etc., but this plan is totally severed from understanding economic reality. saying its a “long term vision” is a simplistic cop out. 1 MIL sf office towers will not be built in san francisco. there is nothing evident now, in the recent past, or the forseeable future to make one rationally believe this is possible. Planning structures of this scale – forgetting about the questionable urban quality and “public realm” it would yield , is an economic loser of a bet. Forcing the uses as office and not residential is doubling down the bad bet. Justifying this logic on “green” ,transit adjacent, planning is a gratuitous cover. This should be sent back to the drawing board. We deserve better thinking. Gil, Agreed on the one system (or 2 or 3) being needed for the Bay Area, but it will never happen (and not because of the administrative perks in the current systems). The Bay Area is mostly suburban in nature, and those voters will never vote to build more transit in the core. We still have Livermore voters who HONESTLY believe that they “deserve” a BART station because they’ve been paying in forever and don’t have service – despite the fact that half of SF has also been paying in and doesn’t have service either. The city of SF is simply too small to ever win one of those votes. In Portland, for example, the city of Portland makes up larger portion of the overall metro population. I agree with Louis here. A massive increase in SF office space seems dubious in the future as there is no demand for this. I think the large office projects still built in the Bay Area will be in Oakland, San Jose, San Ramon area and parts of San Mateo. SSF is going ahead with a new 3 million sq ft. office development. Long term bio-tech demand makes that feasible. Folks need to ask themselves where is the demand for new massive office projects in SF to come from? More to the point, what is the justification this plan uses to support the viability of 1 million sq ft office towers? “No one wants to drive small cars. Bigass gas guzzlers are where the demand is.” – Hummer dealership owner, circa 2006, now bankrupt. During the middle of the last recession, nudniks claimed that San Francisco would not ever need anymore office space ever, just like today. They were wrong. San Francisco has built 12M sq ft of office space since 1996. No one predicted back then that rise of the Internet would lead to new jobs here. It is hard to predict exactly what will drive new employment, but to assume that “it is different this time” and that we will never see any new innovation is undoubtedly a mistake. The regional economy is not a zero sum game and if SSF creates enough jobs to fill 3M of office space, that will only create a spill-over effect here. Did a growing Silicon Valley steal jobs from San Francisco or create more in a virtuous cycle of increasing employment and wealth? My personal belief is that San Francisco will benefit from a spill-over effect of a booming China. Just as most multi-nationals have created regional HQs in Singapore, San Francisco is a likely destination for Chinese companies wishing to plant their flag in the United States. We are no doubt in competition with Los Angeles for this kind of employer though. During the boom years people in general were far too optimistic but now that we are in a recession, pessimism rules the day. This is how it is during every business cycle. To believe that San Francisco, the Bay Area, California and the United States overall are stuck in a permanently reinforcing cycle of doom is a mistake I have seen people make during every recession. If one reviews the report linked above, the planners looked at a variety of studies of the future demand for office space in downtown SF. They determined that the more conservative estimate for office space demand downtown would be 9.8 million SF, while a less conservative approach based on an ABAG study would project a need for 23.5 million SF of office space between now and 2035. If demand turns out to be less than this, then construction can proceed more slowly. However, with the most conservative estimates for growth, under the current zoning there would be eventually insufficient space downtown to build anything else. It makes more sense to zone now for more density downtown, whether it arrives sooner or later. Dan, the problem is these projections are contradictory to the 2007 San francisco magazine review of the SOMA plans. First off, back then, all this contruction was to be built out by 2020. Now they are saying 2035. That’s a huge, huge miss in the initial projection. The magazine review said SF lost 60,000 jobs in the 90s but will gain more than half back by 2020 – 36,000 new jobs. Mostly in bio-tech and Mission bay. The obvious question is if the city lost 60,000 in the 90s and will gain 36,000 back by 2020 where is there a need for a significant net increase in office space? Especially as most of these jobs are set for Mission Bay and will be housed in about 2 million ft eventually planned there apart from the SOMA towers. The bio-tech factor is not playing out for SF in terms of bringing in large numbers of jobs. Those are being committed to SSF hence the huge new 3 million sq ft devlopement. Pfizer I beleive it is backed out of locating offices in Mission Bay and at that it was a token office. Upper management level types but not the labor intensive offices you find in SSF or the Northwest. The numbers do not add up – they didn’t in the 2007 report and this new “delayed” projection (its 2035 now not 2020 for buildout) is even more out of balance. The devil is in the details and the report does not give us the specifics of how they arrived at the conclusion that 9 million ft. minimum is needed. The report said that the minimum of 9.8 million square feet needed was based on projections from Moody’s and REMI. Dan, what is the vacancy rate in downtown SF? Around 20% isn’t it? What does that amount to in available sq ft? I think its around 12 million sq ft but if someone has the exact figure please let us know. Does that 9 million sq ft take into account all the empty office space? Much of it emptied in the last few years? Common sense tells me these figures are bogus or outdated or based on assumptions – Mission Bay generating boatloads of bio-tech jobs above those projected. The AAA building will soon add to that as AAA moves to WC. Schwab is continuing to move jobs from SF – that is new empty space coming. They are trying to sub-lease their Montgomery building. The proposed office building planned for Mission near First was dropped by the developer within the the past year – whatever projections that developer was relying on must have suddenly changed for them to abandoned an approved and designed office building – changed as in no demand for major new office space in the next 5 to 10 years. A net 36,000 gain in jobs over the next 10 years does not add up to a need for new office space. Given the millions of empty office space and the still planned 2 million sq ft in Mission Bay. Gil – what’s the vacancy rate in Santa Clara County? Around 20%, no? Why is your forecast for two areas with identical vacancy rates so different? What in the world was their source for this? SF did NOT lose jobs in the 90’s. SF lost jobs in 2001-2003, then gained jobs from 2004-2007, and has now lost jobs for the past 18 months. Any source that says that SF lost jobs during the 90’s is ridiculous, as the tech boom didn’t end until 2000. Could anyone point to any company that has moved a major portion of their offices and staff to San Francisco in the last 5 years? (10 years?, and I am not talking about 75 Google employees, but real senior coporate staff) This question is not asked to bash San Francisco, but more a concern as to a lack of understanding of where the growth industries ARE in this city. I still am convinced that the growth industries of San Francisco are TOURISM and related industries. Hotels, expensive restaurants, retail based not on neighborhood services but instead on luxury brands, have continued to grow through the 90’s and well through this decade. This city is not the economic job creator of the Bay Area, jobs are created in the South Bay, Peninsula and East Bay. This city is no longer “real”, but a combination historic adult Disneyland, and bedroom community but with more crime and poorer schools. Look at the actual hisory of the most recent economic and real estate cycle. A grand total of ONE significant, new downtown highrise was built. One. This would be 555 MIssion Street, around 500,000 SF leaseable area. It was completed almost 2 years ago and is 50%. This is the best new office tower in san francisco, the developer tishman speyer, was an “early mover” and started early in the cycle, and had the market for n”ew tower tenants” to themselves. OK? so now we are back to 20% effective vacancy and the market absorbed 1/2 of one new tower. thats it. NO ONE will finance a tower that is twice that size (thats what the planners are proposing, and many if them.) unless it has at least 50% pre-leasing. San FRancisco is a good economy, but it is a small company, entrepreneur economy and the types of companies that used to be the “anchor” tenants- wells, b of a, schwab – are either not here any more or are not growth porspects. Major high tech anchor tenants like cisco, intel, etc will never have a major presence in SF because they require floor plate sizes that are far larger than san francisco’s “slender” tower will ever allow. so, were left with small satelite offices of the majors, and small companies who flourish here, but will never pre lease multiple floors in a high rise. Now consider – The transbay terminal in a huge political priority and it is un-financeable without the inclusion of the several hundred $$$ MIL of air rights that must be effectively sold off to private sector developers for the terminal to be built. Look at the TJPA financing plans. If the city backs off on the 100 foot towers, then the feasibility of the transit center officially no longer works. No one want to say this publicly, and let the Feberal subsidies go away, so it will be a long time till the cards are on the table. But the economics of the mega-tower plans do not make sense and there is no one institutional (i.e. “big”) real estate business who believes they do. We deserve better thinking than this plan. … if they city backs off on the 1000 foot towers…. Just that 60,000 mysterious jobs were lost, but with nothing telling how many jobs were gained. Cute. I guess you are going to ignore the excellent post by Louis? What is most interesting is that Louis promotes the idea that we need to stop pretending we are New York or Chicago and start developing urban plans that reflect the reality of who needs what kind of office and housing space in San Francisco. What this “grand plan” tells me is San Francisco suffers from Chicago Envy. ^Aw,c’mon. Any plan that planning put forth would be panned by everyone on Socketsite. Intense SF hate is what most of you people do. If the plan had more residential, Gil would be telling us how SF is emptying and everyone is moving to Portland. If the plan had been for shorter buildings, everyone would be complaining about how SF never builds anything tall like Chicago. This plan tells you that SF is suffering from “Chicago envy.” Do tell, what plan would make you happy? It is pretty funny that in one thread a bunch of people complain about how San Francisco’s plans for Hunter’s Point are not grand enough (like Millenium Park) and now the exact same crowd sees a visionary plan, much grander than Millenium Park and complains that it can’t be done. Louis’s comments are to the point. One point in particular – the Transbay development is riding on air rights for the 1000 foot tower and for other tall towers nearby to make it happen. It is very unlikley a developer will come forward and pay beaucoup bucks for these air rights. Which means the Transbay development will not work finacially. No one involved with this from the planning side is yet ready to admit the obvious – that the emperor has no clothes and Transbay is dead as evvisioned in this plan. The precedent is there already that these air rights are not going to be worth near as much as hoped – the city turned down several proposals for a nearby lot as the developers were not willing to pay enough for the rights. The development deal was withdrawn last spring after the few who bid had spent a lot detailing their proposals. One way or the other the city will eventually have to start from scratch here and the ultimate proposal is not likely to include 30, 40, 60 and 70 story towers. Um, Gil, hate to break it to you, but a developer (Hines) has ALREADY paid $350 million for the rights to develop on the parcel (the 1000 foot parcel). This transaction was completed nearly two years ago. It is likely that Hines would like to sell these rights to someone else, but they ALREADY paid for them and the city ALREADY has this money in the bank. ^Ah, my bad. Regardless, the city isn’t “waiting” to sell air rights, since they’ve already sold them. Was this reduced price deal ever finalized? Seeing as how it came at the time of the “crash” last year, exactly what did Hines finally sign onto and what are their outs? How is the money supposed to be paid out? Given the market, its clear no one is going to build a 1.4 million sq ft office tower in SF. I suspect Hine’s lawyers put in enough “get outs” in the deal that Hines is not obligated to pay the full amount unless they actually move foreward with the project. According to the stimulus funding application that DiFi chatted about around a month ago, the TJPA has Hines money just chilling there. Part of the deal for DiFi to support the TJPA applying for the additional $400 million in stimulus funding was that they have that money set aside. The $400 million application was made (word won’t be announced until later this year) as part of the $8 billion in HSR funding available from the stimulus. Besides “anon”, does anyone else think this will happen? I would rather see a Geary and/or Van Ness subway that would be of real use by the general public instead of empty expensive towers. The whole point of 1000 ft towers is lost when there is no real demand at present or in the near future as shown in the comments by Louis, and the whole scheme reminds me of some North Korean or East Berlin type of symbolism that masks the real problems of the society at large. 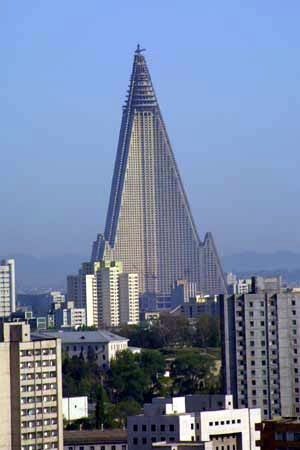 Don’t mind the homeless on the streets or our overcrowded aging public transit, just look at our shiny tower! ^What in the world would cause you to believe that not having a private company build a 1000 ft tower would lead to the tens of billions in public funding needed to build a Geary Subway?!?! The public money (stimulus money, money from developers buying the land) is for the Transbay Terminal and HSR. The upzoning to greater heights allows publicly owned land to be sold for more money. Upzoning the land for greater density does not take away public money that could be used for transit– just the opposite. It is a funding mechanism for the Transbay Terminal. And it’s brought in $235 million dollars so far to help build a transit center for the public. Read the minutes available on the transit center site carefully and you will see that the bulk of the “Hines payment” is contingent on several events that have yet to happen. they have paid small $$ so far, it is a contingent deal. Hines has smart people. the $235 is nothing like assured. i dont think anyone in the City has represented that it is, if you read carefully. Exactly. Hines’ lawyers you can bet put outs in the contract. As noted only a small percentage has been paid out so far. All these deals are contingent. I expect Hines to walk in the end – try to sell its rights or, if it can’t, back out of the deal. That means no big bucks. There is certainly a penalty for Hines to pay if they back out but it is likely small compared to the re-negotiated 235 million. That Golden Gate Park part is a little overdramatized by retellings of the freeway revolts. The Panhandle Freeway would have tunneled under the park before meeting up with Park Presidio/Western Freeway. And the Western Freeway would have been in a double-decker trench. It would probably have been better than 19th/Park Presidio/Crossover is now. Gil, Louis, what would you prefer the city do with this property? Give up on the potential for the $235 million and $400 million (stimulus funding) and change course two decades into planning? Tell the voters of California (who voted for CHSRA) to shove it, and that we’re no longer interested in an HSR station there? I’m really confused on Gil’s thoughts. Everyone’s moving to Portland or Seattle, so I don’t see what it matters what happens to this property. corntrollio – the Panhandle freeway would have destroyed the panhandle. The entire thing would have been freeway in a trench. Also, the interchange to meet up with the Western Freeway would have essentially destroyed the Inner Sunset, as it would have required demolishing more than 20 blocks. Louis, Gil, I just read through the “contingencies” on the Hines payment – it’s ALL public stuff that must be done (city/CHSRA) and not contingent on any other private development. So, as long as SF stays the course of this plan, Hines is on the hook. Right now, some of SF’s financing for the Transbay Terminal is hoping to coming from private fees and such on currently vacant parcels. However, out of the blue we’re likely going to get $400 million in unexpected federal funding, with more (from the next transportation bill) VERY, VERY likely. Obama likes high speed trains. Pelosi likes high speed trains. Expect more federal money coming our way, regardless of what happens with private developments surrounding the station. First off, the planning needs to start anew and be realistic. These plans were hatched in the bubble days and are clearly unrealistic. The Tishman tower on Mission, state of the art, and just 50% occupied in the 2 years its been opened. And this is a “small” building – around 500,000 sq ft. Another smallish high-rise across the street was abadonned because the devloper saw no demand for another 500,000 or so sq ft over the next decade or so. The city saw a potential gold-mine here. They could extort all kinds of fees from developers for these buildings. It was all about money and power – not about what was good or realistic for SF. As to the HSR – I voted against it. It is not needed, the state can’t afford more bond issues. The state is going to be 20 billion in debt again by the end of next year according to some reports. I still think HSR is going to be delayed. So go back to the drawing boards, do realistic projections of jobs, housing needs and office space needs. If we are in a jobless recovery and entering a stagnant decade as Japan has experienced, all bets are off on this plan. But IMO they were off to begin with. Just what we need, the government printing more money it does not have to give Peelosi and Obama their train “toys”. Absolutely reckless, absolutely inexcusable. Ah, the “trains are toys” argument. Well, good news for us then, because the Chinese (as well as pretty much all of the EU, Russia, Saudi Arabia, Argentina, Brazil, and India) are spending a LOT of money on toys. Guess we don’t need to worry about them overtaking us economically if they’re spending all their money on toys. I’m assuming that you probably haven’t been outside the US much (my job had me live in Europe for about three years and Japan for two – spent three months in China earlier this year – we’re going to get absolutely killed by the Chinese over the next 30 years because of our lack of infrastructure investment, IMO). FYI – you’re not going to be happy with your dream cities Portland and Seattle, as they’re both spending loads of money on toys and exploring the possibility of spending a LOT more to link the two cities with toys. Been to San Jose recently? There’s a tower downtown that has been empty for nearly a decade. There are some brand new buildings along 101 that were completed over two years ago and still sit 100% vacant. I’ve asked you a dozen times, and you’ve NEVER responded – why is your view of the South Bay so much rosier than SF when vacancy rates are just as high (or higher in some areas) as SF? The South Bay cities have plans to add millions of square feet of space (especially San Jose) even though millions already sit empty. Help me with this “logic” please. If a building is vacant in San Jose this is good news for San Francisco? The Tishman Tower on Mission Street is 50% empty after two years and yet that is much better than an empty tower in San Jose? I think this tells me the whole region is either overbuilt, or in a poor economic cycle, or both! ^The logic is that Gil keeps proclaiming that SF is dying, but the South Bay is not. Either both are dying or both are not. I am not too optimistic on the South Bay or Bay Area in general. The Bay Area is not projected to be one of the job hub cities of the US for the next decade. Overall, the Bay Area’s growth in population and jobs is going to be lagging the new emerging vibrant cities. It will become relatively less important over time. Create a plan that has more numerous and smaller planned structures, with more flexibility on use. Lower possible $$$ proceeds, and much higher probability of ever realizing them. Its just the difference between the possible and the “ideal”. This is SF and you basicaly get one chance at major area planning. The consequences of an all or nothing bet on what amounts to a hail mary pass are huge. Well, Gil, I can agree with you there. In the US, once areas are built out they’re rarely job growth leaders – the Bay Area of the last twenty years was an anomaly. New York, Boston, Chicago, Philadelphia, etc haven’t been job growth leaders (in percentage terms) in decades. However, that doesn’t mean that all growth stops or begins to go negative. It just means that jobs that have no particular value in being located anywhere in particular will seek out cheap places to expand. I would expect the Bay Area to follow the trajectory of Boston or New York and revert to slow, steady growth in high value industries, rather than wither and die like Cleveland or St Louis. Does anybody else find it funny how Gil neurotically and incessantly rants across multiple posts about jobs disappearing and NorCal declining and lalalala, yet he tells us the reason he stays here in the Bay Area is……..his job??? By myopia or by denseness, the irony of this seems to elude him. Why is it so hard to believe someone may actually desire to move AWAY from the Bay Area? By myopia or denseness, it seems the decades of neurotically and incessantly telling eachother that we live in “the Best Place on Earth” has been missed by some such as Gil. Gil forgot to drink the KoolAid! Perhaps he has travelled to other areas and taken into account the less expensive cost of living and opportunities to live in a safer cleaner neighborhood? Gil, when you do move away, what is most interesting is to see the city as it really is on a return trip after about a year or so. Many of my friends who have moved away return and cannot stop talking about the homeless, trash and overall rundown decay that they observe on return trips to the city. Gil can think whatever he likes. But who is trying to convince whom? There are different flavors of Kool-Aid. Gil is to San Francisco’s prospects as Tipster is to everything even tangentially related to any area of commerce. Was that my point, Gil? I find it easy to believe. Do you think you and your friends are special and unique? For years, people like you and your friends have moved to town and immediately over fetishised the place. Then, when the naive notions of utopia wear off and you leave, you over criticize negative aspects that were there the whole time (and years before) you thought it was “the Best Place on Earth”. If it takes you until you move away to realize that there is a homeless problem in SF, what does it say about your intelligence? There have always been lots of people moving out of SF, and lots of people moving in. (Only occasionally is the movement mostly one-way– e.g., in during the dotcom boom, then out during the bust.) The children of those who settled in SF early in the 20th century moved out in the decades after WWII, making way for gays and lesbians, immigrants from Asia and Central America, techies, and hipsters. Generally, this has made SF a city enriched with younger, highly educated people, entrepreneurs (whether opening up produce stands or Twitter), consultants who can work from anywhere, etc. Folks like Gil, for whom the cost or hassle of the city is too great, move to Sacramento or Oregon, but others seeking what SF has to offer take their place. And mostly that makes SF a more vital place. Great cities constantly reinvent themselves. Dying cities remain stuck in the old way of doing things until the world passes them by. San Francisco has been many things: a mining boom town, a dock city, a manufacturing center, a finance hub, a technology hub, but it is never the same thing for long. Hard to say what is next, but it probably won’t be boring. This idea that San Francisco is a city that embraces change is rather funny since many around the world view San Francisco as a historical touristic destination. A newer version of Prague or Venice without the long rich cultural backround of those cities however. 100 year old cable cars very slowly rattling down a hill past 110 year old stick built homes with gingerbread details is not my idea of the city of the future. If San Francisco was the economic engine attracting young PHD’s and Hipsters and Techies, why doesn’t the population grow as fast as other urban areas that also are constrained by hills and water? Why does it not attract the large numbers of young and educated that other cities are? I submit that San Francisco’s unwilling ability to change is why we are no longer the financial, industrial or cultural hub of the West that we were 100 years ago. BTW- Why doe Gil have to move to “Sacramento”? Why not Seattle, Chicago, Boston, Paris or London? I always find it curious when San Franciscan’s pick urban alternatives that are always lesser cities. ^So is your assertion that the Bay Area hasn’t grown? Or is it your assertion that the city of SF hasn’t grown as much as Boston (hundreds of thousands below its peak) or Chicago (even farther blow its peak)? You’re really saying that SF doesn’t attract “the large numbers of young and educated” as other cities? Which cities (which have constrained city limits, as you said( would those be? People around the world view Northern California as a region, and SF as its cultural capital. All of Europe views SF this way. Whatever. If Palo Alto and Cupertino are attracting young techies and PHD’s, then why do San Francisco realtors use that as an excuse for the future health of Bernal real estate prices or SOMA shoebox condos? San Francisco may be the cultural capital of this region, but it is not the economic capital. I can imagine a case being made for SouthBay or Peninsula investments, but why would an overpriced house in the outer Sunset benefit when the “growing” population of the Bay Area will require people to live closer to their jobs instead of to their favorite coffee house. ^Who’s talking about real estate prices? Prediction….The Purple Line extension from Koreatown to Santa Monica beach will be completed before the Transbay Tower has begun construction. And unlike Transbay funding, voters in L.A. already passed a tax increase to fund the 40 BILLION (!) for subway extensions, new rail and underground lines, and road repair and expansion projects. ^LA still has to qualify for and receive billions in federal matching funds to make the subway happen. Also, it’s much easier to fund transit improvements like subways when you can spread the cost across a 10 million person county (LA County), instead of the nine separate fiefdoms (counties) that don’t want to share with each other here. I actually love the “Grand Plan” for the transit center (love that Pelli design) and I hope for all our fortunes that SF does experience enough job growth in the next 25 years to support the ptroposed highrises. If Palo Alto and Cupertino are attracting young techies and PHD’s, then why do San Francisco realtors use that as an excuse for the future health of Bernal real estate prices or SOMA shoebox condos? They do? How so? Some people like cities. Some don’t. Seems like that is your point. In that, I agree. Bravo Anonn! San Francisco buyers are looking for a different type of lifestyle experience than someone in Palo Alto or Cupertino. Many San Franciscans want a car free lifestyle with a combination of walkable neighborhoods and good, safe, clean and rapid transit. I guess my problem is it always seems that the transit planning emphasis is placed on the sizzle and not the steak. Now they are worried about a “Transit Center District”, PLEASE, we only have one subway line in this city! I could care less about a central transit station having great architecture, spend the money instead on more and better trains, additional tunnels under the bay, a Geary subway line, a subway line connecting the Pacific Heights and the Marina to the rest of teh city, “express trains” which would require additional tracks, and BART to Palo Alto. Why is it that very old systems in Chicago and New York have enough tracks to allow express trains that can travel 14 urban miles in 18 minutes? When at Northwestern University, I could ride the “Evanston Express” and have no stops all the way to Lincoln Park and then the Loop, in less than 20 minutes bypassing almost 25 stations, this would be like getting on a BART train at Berkeley and riding it non-stop to the Civic Center, and then not stopping again till SFO. Chicago did not have fancy stations or “Transit Districts” but it did have dozens of subways, “L” lines, and Metra (Caltrain) routes all planned to work together providing a layer of service that was on many occasions FASTER than driving. We may end up with a fancy station and huge empty tower and still only one subway line under Market Street. Why is it that very old systems in Chicago and New York have enough tracks to allow express trains that can travel 14 urban miles in 18 minutes? Because they were built in times before unions, building codes, EIRs, ADA compliance, and in non-earthquake zones, as well as with governments substantially more corrupt and opaque than exist today. Take a look at the cost of the new 2nd St subway in NYC (approaching $3 billion a mile, probably will end up higher when all is said and done), and then you’ll figure out why Chicago and New York’s systems could never be rebuilt today. Geary Bus Rapid Transit (BRT) would get the job done for 100th the cost. I’m still amazed that we are about to hit the decade mark on getting translink up and running. ^Agreed. A Geary subway line would only be worth it if we were willing to discuss upzoning the entire Geary corridor. Diemos, have you seen that Geary BRT is now forecast to be operational in 2015 at the earliest? You are right that it would be 100th the cost of a subway, but who would ever think the planning of dedicated bus lanes could take over 10 years? I imagine Chinese urban transit planners must be laughing at us. As for Anon’s comment about Unions and Building Codes, ADA , etc, this is a valid and interesting point as well, but didn’t unions build the Golden Gate Bridge as well as the Bay Bridge? I wonder if labor is the problem, or instead is it how bloated government functions today vs the past? ^Government “bloat” depends on who you talk to. Sure, some needless bureaucracy has increased prices somewhat, but many things acceptable then would simply not be today. Dozens of people died building the subways in NYC and Chicago, and that was considered normal. Lives are considered much more sacrosanct now. Eleven people died building the Golden Gate Bridge, and that was considered exceptionally good (and no major lawsuit amounts were paid out!)! Can you imagine if five people died building the San Jose BART extension? All hell would break loose. BART would be sued for hundreds of millions. What’s amazing is that it’s just a couple of business owners who’ve managed to hold that up all this time. Are you sure you were not thinking of Los Angeles when you wrote this, which HAS become the financial, cultural, industrial and economic hub of the West? Are you sure about this? I look at the list of Fortune 500 companies in California and I don’t even see one LA area company until number 7. The list is dominated by Bay Area companies, not Los Angeles companies. And not even one LA area financial company is a Fortune 500 company. How can it be the financial hub of the West? LA has a lot going on, but I think you overstate its financial importance. Culturally it is huge, because of Hollywood, but that is “Old Media” and is threatened to be overtaken by The Internet, which was born and raised here. There is much more light and heavy industry in Los Angeles, this is definitely true. I left the region partially because of the negative impact of all of that industry and all that smog. But it does keep people employed. And even if your claim that San Francisco is an economy primarily based on tourism was true (it is not) this would still be a reinvention of itself, would it not be? Dying cities are places like Detroit that are are one-hit wonders, unable or unwilling to adapt to changes in the economy. It was too dependent on the American automotive industry. Although I would NEVER want to live in L.A., I am not blind to how much more powerful that area is on the world stage. Never measure an area’s importance by fortune 500 headquarters, since that is an old way at looking at regional economics. Los Angeles #1 and Orange County #3 are areas of huge wealth and yet they didn’t need Cisco or Google to create all this money? (Perhaps there are other ways of creating wealth besides working in a cubicle for an internet start up?) Why did the Pacfic Coast Stock Exchange move from San Francisco to L.A.? You have many good posts, but please, do not compare the Bay Area to the L.A. area which has a much larger economy and population. S.F. is always worried about L.A. and L.A. could care less. Did you notice New York was not in the top 3 btw? The first county on the wealth list in the Bay Area is in the South Bay, not San Francisco. P.S. The number one employer in San Francisco IS “tourism and related industries”. Would you like me to provide the link? Obviously, the county of San Francisco, with less than 1/10 the population, is not going to have as many millionaire households as Los Angeles County. By NotAgain’s measure, Los Angeles is also the poorest place in the the United States, as LA County has the most households living below the poverty line of any US County. It has the most of almost everything, because it’s population is so much larger than any other county. NotAgain!, too funny. You’re simply comparing the size of counties. The Bay Area is split up into nine counties. NYC, the city itself, is split up into five counties. LA County has 10 million people and is the largest county in the US by almost 5 million people! It would be BIZARRE (and mean that the county was exceptionally poverty ridden) if it wasn’t number one on a list of millionaires. Try looking at things per capita – or at least by MSA, not county. Why did the Pacfic Coast Stock Exchange move from San Francisco to L.A.? The number one employer in San Francisco IS “tourism and related industries”. Would you like me to provide the link? Um, so? Tourism requires more low value employees. Number one employer doesn’t even come close to meaning most important employer or industry. I’ve only got seven employees, but each one makes twenty times (at least) what a coffee shop employee makes. “Greater Los Angeles Area is an economic powerhouse, ranking as the third largest metropolitan economy in the world, behind the Greater Tokyo area and Greater New York”. as for wealth, just like the Bay Area, if you live in Marin everyone is wealthy, if you live in the east East Bay, every other home is in foreclosure. You cannot take San Francisco and compare it to Compton, when it reality it should be compared to parts of the Westside of L.A. We have a lot of wealth in the Bay Area, but so does Southern California. ^I don’t see anyone saying that there isn’t massive wealth in the LA area. Of course there is. Sure. The more data the merrier. The top employers are mostly government, the UC and various hospitals, but it is possible in aggregate that tourism tops government employment. Los Angeles and the surrounding region is no doubt a much bigger powerhouse in most areas than the Bay Area. LA can legitimately claim to have an economic, cultural and political power that rivals that of the world’s largest metropolises, the Bay Area cannot. But your specific claim that Los Angeles is a larger financial center does not seem to be borne out by the evidence and you have not so far produced any real evidence to the contrary. Your statement that the Pacific Stock Exchange is based in Los Angeles is false. Los Angeles is the bank owned and repossessed real estate capital of the West, is that the kind of financial powerhouse you meant? Did anyone else read that Caltrain is now pushing back the possible electrification project to 2025? Why in the world do things take so long here compared to other parts of the world? They are building Maglev’s in China and TGV’s in Europe and we still have diesel engines puffing smoke and making intolerable noise through dense urban neighborhoods. It will take six more years before a possible dedicated bus land on Geary? Don’t even get me going on what has happened to HSR! How are we going to compete with other regions of the world when we cannot get our transit up to “world class” status? To understand the decades worth of transportation construction we need to complete to catch up to the rest of the world, I am reminded that my British cousins take the Eurostar to Disneyland Paris, and return home on the same evening. Note how clean the station is and the Disney band who provides send off for passengers. Did anyone else read that Caltrain is now pushing back the possible electrification project to 2025? No where did you hear that? I did hear that San Mateo counties losses in their Lehman investments might set the schedule back, but I had not heard that it would be set back 10 years. The Bay Area, along with the rest of the country, prioritizes building more freeways over other forms of transit, so that is why it takes so long. I think it is a big mistake. The HSR project is progressing fine, what are you talking about anonfedup? Did anyone else read that Caltrain is now pushing back the possible electrification project to 2025? Why in the world do things take so long here compared to other parts of the world? They are building Maglev’s in China and TGV’s in Europe and we still have diesel engines puffing smoke and making intolerable noise through dense urban neighborhoods. It will take six more years before a possible dedicated bus land on Geary? Don’t know where you heard the Caltrain thing, that’s not even close to true. Things take longer here because we’ve now decided as a society that no project can ever cause ANY discomfort to anyone or hardship to anyone during construction, regardless of the benefits provided afterwards. For example, we could build the Central Subway for one third the cost (and with better operations) by building a shallow tunnel that crosses Market on the mezzanine level of the Market St subway – BUT, that would require tearing up the streets, so a ridiculously expensive and horribly designed deep bore tunnel (which will be far worse for users for decades and decades) is chosen instead. Wouldn’t want to inconvenience businesses for two years. Instead, we inconvenience transit riders for years coming up with a design, then for decades more after we choose the worst design – ONLY because we’re worried about a few years of construction time. We used to not care at all about impacts during construction (which was wrong) – now that’s ALL we care about (which is also wrong). I know that another lawsuit stopped the San Jose-Gilroy line from receiving any funding and I can’t find the SFGate article that mentioned what I quoted from above in the San Jose Mercury News. Perhaps this was later resolved without delays but I remember reading that Atherton was putting a lot of energy fighting electrification and HSR. Not sure if this helps, but I thought I would post these from Cached files from the Mercury News as the articles are not able to be linked at present time. ^All of that is either resolved or has nothing to do with Caltrain electrification. It is true that there are some pending lawsuits regarding the EIR for HSR, but that’s just part of the process. The only way to challenge something in CEQA is to file a lawsuit. The simple filing of one means nothing. The money talked about by Diridon was GRAVY on top of other money. If Caltrain/HSR doesn’t get stimulus funds for electrification, it doesn’t mean that they’ve fallen behind schedule – it’s just that if they get money, they’d now be AHEAD of schedule.